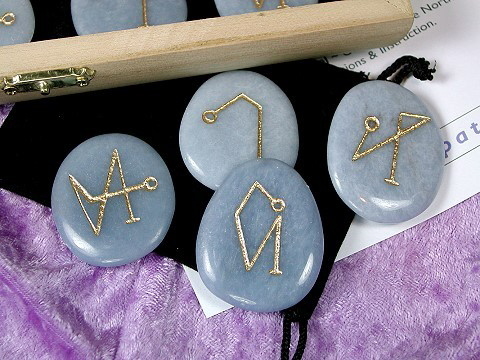 These unique stones have been hand carved with the powerful sigils of the four main Archangels; Michael, Gabriel, Raphael and Ariel (also known as Uriel). These beautiful stones have many uses. To connect with the Archangels, for channeling, meditation or to invoke any of the individual Archangel’s healing powers or energies. You might wish to invoke Archangel Michael (the guardian of lightworkers) with his flaming sword of truth, to help you see the truth in a situation; or you may simply feel you need his protection; from fear or psychic attack. Maybe it’s the gentle Archangel Rapheal you are in need of connecting with; to call upon his benevolent healing energies, ‘the healing power of God’, to protect you on a journey or to assist in some space cleaning. 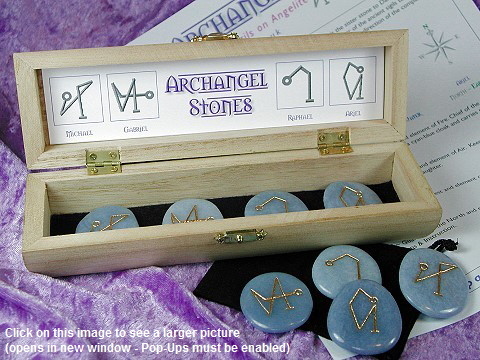 Whatever the reason, these stones are a valuable healing tool for anyone wishing to connect with the Archangels. Carved in Angelite, the Stone of the Angels, they carry the perfect resonance for angelic communication. The addition of the individual Archangel’s sigil further enhances their energy. A sigil is a symbol created out of geometric or abstract forms, specifically for magical purposes. The word is believed to have come from the Latin sigillum, meaning ‘seal’. Runes or bind runes (two or more runes combined) are another example of a sigil. Finally, these stones are embellished with genuine gold leaf which imbues them with the Golden Ray. The Golden Ray is one of the highest healing vibrations the physical body can absorb.